Do delivery drivers have trouble finding your house? Do you often find visitors driving past a couple of times before finding your address? Many modern estates, in particular, have unorthodox numbering conventions and it is not always simple to find the house you are looking for. Displaying your house number prominently is the solution, but it can be a problem finding an appropriate space to display your house number clearly. The solution is decorative house numbers from Purlfrost. If the houses nearby all look similar, it can be difficult to make your home stand out. When it comes to new builds especially, there are often limitations on changing the external appearance too drastically. It is possible to make a small change that will really affect the appearance of your home. For example, displaying stickers with your house number in your own choice of design, font and colour scheme. Adhesive house numbers are a quick and easy way to show the world your house number. They are particularly useful if you have a fanlight above your door but do not want to go to the expense of having special glass made up. You can have a stained-glass effect – or whatever style you choose – and change it as often as you like . If you have a door glazing then the decorative house numbers can stick to that instead, or even onto the exterior of the uPVC frame itself. For the best results, we recommend applying the stickers to the inside of the glass, protecting it from the elements. The external application is possible if your glass is frosted and would make the number illegible were it attached internally. 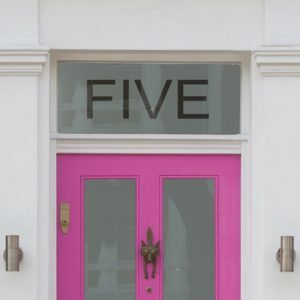 The custom-made house numbers and name stickers from Purlfrost are simple when applying to any glazed or smooth surface. They will really make your house stand out from the others on the street. They are perfect for a transom window or fanlight above a door, or a glass panel in the door itself. You can have our house number stickers made to the exact measurements you require. A choice of finishes are available: frosted film coloured vinyl or stained glass effect. 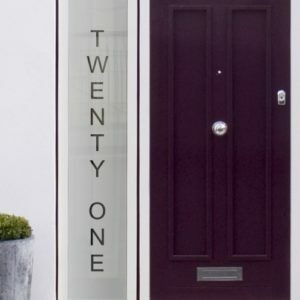 Our online design service is simple to use and allows you to design personalised house numbers sticker or house name in your choice of colours and fonts. Adhesive house numbers are easy to apply and will last for many years. 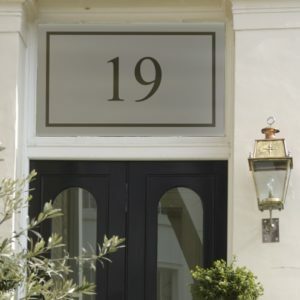 Our personalised house numbers are designed to be applied directly to glass windows or doors. As long as the design you select has enough space, you could have a house name instead of a number. As well as house numbers for your front door, we can also supply adhesive numbers to be used on other items. For example, wheelie bins – the stickers will adhere to plastic, metal and almost any other smooth and flat surface. Get in touch with us here at Purlfrost today to discuss your needs!